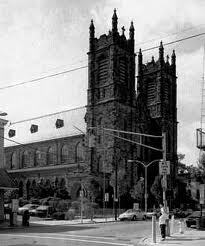 Holy Cross Parish, originally St. Pius V parish, was established in 1865, and the name changed in 1886. Founded in 1865 as Saint Pius Parish, the name was changed to Holy Cross in 1886. A large brownstone building, it was built with local stone in 1890.